Grandpa Tom died today. I miss him already. My first ‘memory’ of Grandpa Tom isn’t a memory as such, but rather a photo. There’s young me aged about five shooting him with a water squirter while he’s lying asleep on a deckchair. I don’t remember the incident as such, but I do remember the photo – I’m just sorry I can’t find it. Skip forward a few years and my first ‘proper’ memory of Grandpa Tom is from my teenage years when we used to do gardening together under the watchful supervision of my dear old Gran (Sheila). Gran was a very small, frail lady, who was partially sighted but possessed with a great spirit and energy, which she applied to the directions she gave her two reluctant workers as we chopped, dug and scraped our way around their small back-garden. We didn’t say much to each other, but we shared that bond you get when suffering quietly in adversity, as I balanced precariously at the top of a ladder while Grandpa Tom collected the rubbish down below. Lunchtime would always be the same: chicken-flavour Bachelor super noodles followed by a chocolate roll, or two if we were lucky. On extra special occasions we might even get beans and cheese on toast and a cup of tea before trudging back outside to get covered in cuts and bruises in what must be the prickliest garden in the whole of Ramsgate. Years passed and I’m sorry to say Gran died all too young, leaving a massive hole in all our lives. Thankfully, many members of the family rallied round to help support Tom, who was my Gran’s second husband though considered us all part of his increasingly large family. I’m pleased to say that as Tom grew older, he retained all of his faculties into old age. He could sometimes be a bit hard of hearing, or a bit slow and bumbling in his way, but his intelligence was as sharp as ever, and he possessed a great sense of humour. He especially loved his novelty socks, which he’d demonstrate to us with great pride whenever he got the chance. 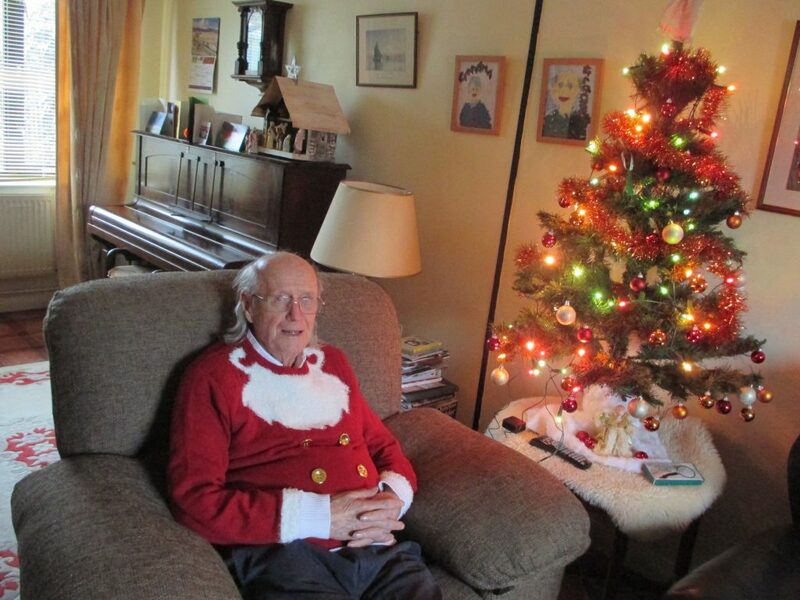 He also loved his novelty Christmas jumper, which I bought him several years back. 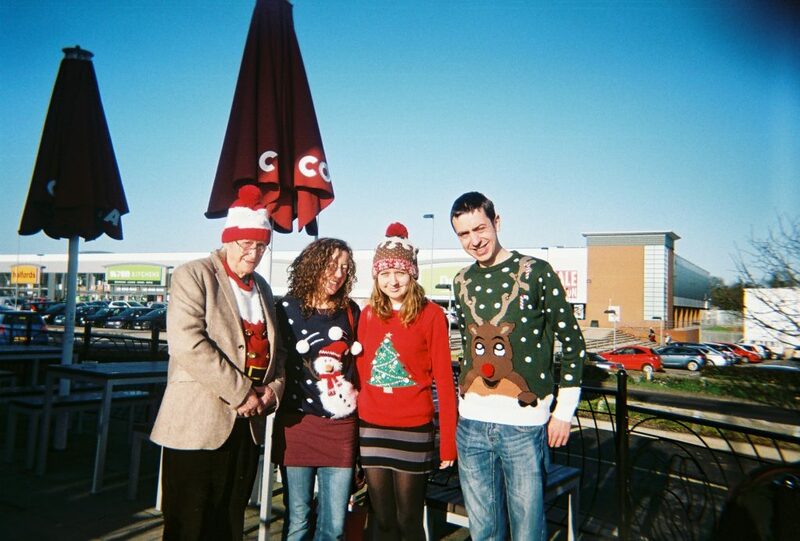 From that year on he would insist that my mum, sisters and I would all meet up each Christmas wearing our jumpers. I’m glad to say we did this each year right to the very end. One of my favourite adult memories of Tom is the time we used to spend visiting the cafe at Manston Spitfire Museum with mum on a Saturday. Tom would love our weekly outings: he’d normally have egg and chips, and a cup of coffee, while I’d have sausage, chips and beans. If it was a nice day we’d then sit outside and enjoy the weather while eating Magnum ice-creams and playing a game of who could make the most mess. Invariably Tom would win as he was always a slow eater, and would often drop chocolate on his trousers, and was even known to get ice-cream on his hat! When I was set to move away to start on my PhD at Lancaster we had an extra special trip to the cafe, with Nicky also with us. Mum even arranged balloons to commemorate my leaving, which was really nice, and we had a great time sitting in our usual spot, Tom enjoying his egg and chips, and me my sausage, chips and beans. In the past couple of years there have been several family weddings that Tom has been a part of. Tom was always a great wedding guest, and great fun to have along. When mum married Graham a few years back, she decided to have a medieval-themed wedding. It didn’t take much persuading to talk Tom into coming as a monk. He even grew his hair for the occasion! One of my favourite memories of Tom from Kate’s wedding was the time he thought my friend David was two people as David wore a different outfit to the wedding than he did to the reception. We had good fun laughing with him about his mistake afterwards, as he wasn’t the only one! During the summer of 2017, as a man of a spritely 87 years old, Grandpa Tom took the train up to Lancaster for a holiday and to visit the ‘northern’ members of the family living in Morecambe. We had a great couple of weeks, and we often went out together in my sporty Fiesta ST, which isn’t exactly designed for old men, but to which Tom gladly took as we visited attractions such as Stott Park Bobbin Mill and Furness Abbey. I also introduced ‘young Thomas’ (as we sometimes called him) to the wonders of bird watching at RSPB Leighton Moss. Though he couldn’t walk very far, he really enjoyed sitting just outside the visitor centre watching the birds, and then having a nice cup of tea and cake in the restaurant. On the final few days mum and Nicky also came up to visit to join Tom on the return train journey home. We ended up having dinner in the Merchants 1688 pub in Lancaster – Tom liked it so much we ended up eating there three days in a row. I will now always associate that pub with Tom and the three consecutive dinners we had there. I think the staff thought we were a bit crazy, but Tom had a good time, and that’s all that matters. For a man in his 80s, Tom was remarkably adept with technology, and even had a mobile phone. We’d call each other every so often and I’d text him to check he was ok. He used to text mum every day, and loved keeping in touch with his family. My final memory of Tom was from several weeks ago when I visited Ramsgate to see my family over Easter. Mum was busy with work, so I went with Tom to Boots to collect his new hearing aids. His hearing aids were an absolute revelation, and made such a massive difference to his life I am only sorry he didn’t get them sooner. It’s a shame that at the time I didn’t realise this would be the last time I’d see Tom in person. It was only a few weeks ago now, and in my head he is still the funny old man who used to make a mess eating ice-cream, and who loved telling stories about his life as an electrical engineer, and later on Thanet District Council. 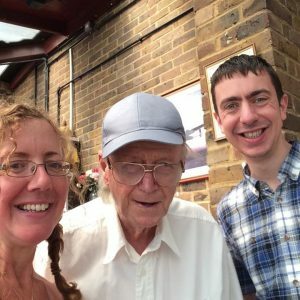 I write this blog having just got off the phone to several people to whom I’ve just broken the news about Tom’s sad passing. Every single one has been as shocked as I was, and each one has commented about what a really lovely man he was (or words to that effect). I think, looking back, I’d agree with what my friends and family have all said: he really was a really lovely man. He was also highly intelligent, great fun, and loved all members of his family dearly. I shall forever treasure my memories of cutting down prickly plants at Gran’s behest, and sharing Magnum ice-creams with him at Manston airport. I will also forever associate him with novelty socks and Christmas jumpers, steam trains and canal boats, as well as elephants, and the Womble named Tomsk (long story). I’ll miss you Grandpa Tom: we all will. I will miss your laughter, your naughtiness and your fun. Most of all I will miss your heart, which had space for everyone in it. Beautifully and eloquently put. A wonderful tribute to an incredible man.